Russ Golata was Born in Western New York, where he began his writing career as a prog rocker. High school English teacher encouraged his Lyric writing was pretty solid poetry. This led to many poetry readings and fellowship with Western New York Writers. 15 years ago he moved to Orlando Florida, and jumped into a writing community filled with gifted poets and writers. 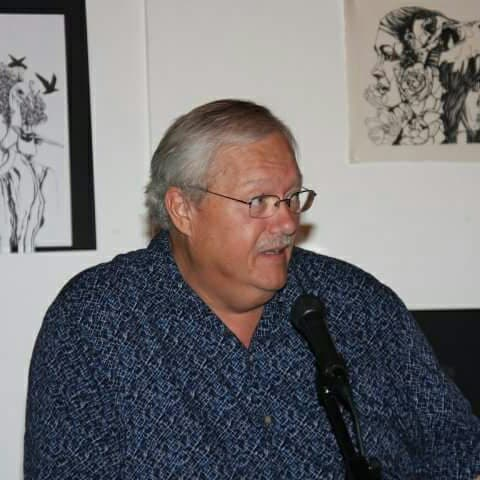 Russ led the Orlando Poetry Group and was a founding member of Poetry Ensemble of Orlando. 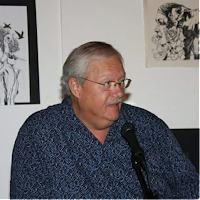 Russ has released four books of poetry in the Fragments series, and has had his worked featured and edited three Books of Florida poet anthologies. A man of a few words, Russ opens his mind with usual brevity in this interview. 1. Gopal Lahiri: How would you describe yourself and your work? Russ Golata: A poet that looks at life through works with a sense of humor. 2. Why do you write? Does it come naturally to you? 3. How did your interest in poetry begin? 4. Do you believe that poetry is nothing but an echo of the life routine that are mirrored by the reality? 5. Have you any preferred style of poetry you like to write in? 6. Who are your favorite poets? Tell us if any of them have influenced you. 7. You are the founding member of Poetry Ensemble of Orlando besides hosting the monthly Orlando Poetry Group readings and also you are the member of Vista Writing Circle of Orange County. Share your experiences with us. 8. You are an accomplished poet in America. How do you approach poetry? 9. Your fragments series of poems in the book ‘Fragments of chance’ are very unique. Can you elaborate on this? 10. What are your expectations for the year ahead? Any word of advice to young poets and writers who are trying to get their works noticed? 11. What is your thought on social media impact in our life? 12. Music is always very close to your heart. Do you think music and poetry can walk together? 13. If you could make a wish and have it come true what it would be? 14. What are you reading right now? 15. What final words you would like to share with us? Walk into a bar and ask where Mohammed is? About additional commandments, and the price of oil. Asking for a double helping of big time redemption. Loved this snapshot of Russ. Ah - Whitman. Yes! Very profound poem. Loved it. If there is nobody to blame, then we are all innocent...Oh jeez my friend, this is my favorite part of all of your words.